Own the Fantasy and shop at Twiggy's Treasures! Anyone that uses our shop option on Facebook to order directly from our website will get a 10% off coupon for your NEXT purchase!! So Happy Shopping and liking!! Free shipping with a $200.00 purchase in the 48 contiguous states only. Best Swords for Sale! From Dragon Swords to Katana Swords & More. We Also Offer Asian Fans, Throwing Knives, Shields & Much More at Twiggy's Treasures! Samurai swords, dragon swords, Asian fans, knives, martial arts swords and medieval swords are all great images of the illustrious pasts of our ancestors. Finding these great items online can be a taxing process. Different sites may specialize in specific swords but not in others. Never fear! Twiggy's Treasures is designed to be the one shop that "has it all" when it comes to dragon swords, fantasy swords, knives, daggers, samurai swords and even battle axes. The variety of sword for sale at our site cannot be beat. Each item in our shop is carefully handcrafted by the best builders in the business. Each is tested carefully for strength, durability, flexibility and realism. We want to offer only the most realistic samurai sword for sale at our site. We want to beat all our competitors by offering only the finest quality metal, woods and crafting possible. Twiggy's Treasures has been operating for over a decade and we have become one of the most trusted and reliable sources of swords on the market. Are you looking for a unique dragon sword that looks and is battle ready? We have them. How about military swords that showcase the unique seriousness of military swords? We have that too. Are you interested in more fantasy based swords, such as those featured in the "Lord of the Rings" movies and books? 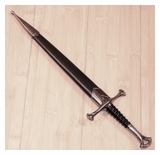 We have a fine collection of "Lord of the Rings" swords that are designed to look as close to the original as possible. Twiggy's Treasures also offers a wide range of original fantasy swords that are created by some of the finest sword designers on the planet. Twiggy's Treasures also has "Blade" "Sucker Punch" "Braveheart" "Chronicles of Narnia" "Kill Bill" "Kingdom of Heaven" "Star Trek" and many more movie and book related items. These items are designed to look so close to the original you'll swear they were the props from the movies. However, each is handcrafted with the finest metal, woods and cotton to make swords for display. So why not look through our catalog today? Our sales section can't be beat when it comes to offering incredible items at dirt cheap prices. We accept Visa, MasterCard, Discover and American Express credit and debit cards. Our services have been rated as "reliable" and "safe" by the "Trustwave Trusted Commerce" group. All of our transactions are protected by the "BBB Online Reliability Program."